The American Association for Cancer Research (AACR) is a founder and organizing partner of the Rally for Medical Research, which took place for the fourth consecutive year this fall, bringing representatives of 300 organizations together in Washington, D.C., to advocate for continued funding for the National Institutes of Health (NIH). Medical research funding stalled dramatically in 2013, when the government enacted deep federal budget cuts in a period known as a sequester. This past year brought renewed progress, as Congress provided a $2 billion funding increase to the NIH. Currently, the Senate Appropriations Committee has proposed another $2 billion increase for the NIH in fiscal year 2017. 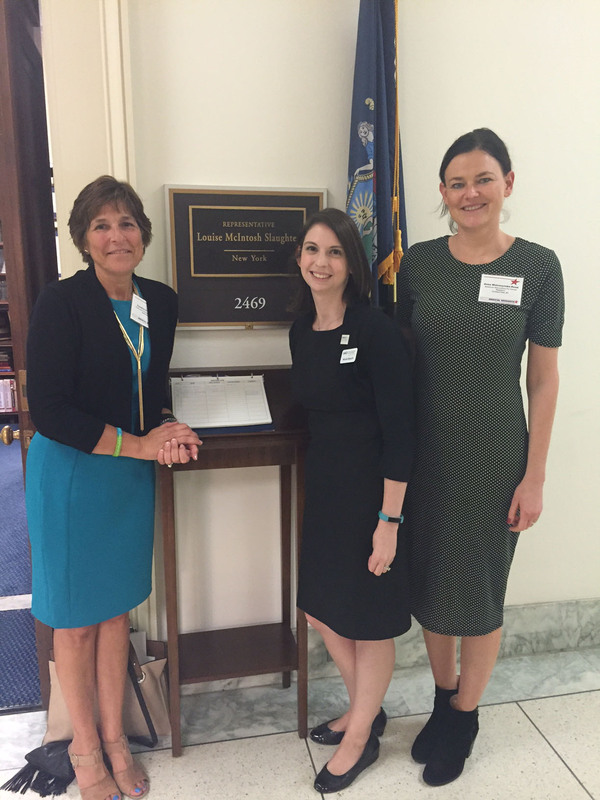 Yet two advocates who shared their day on Capitol Hill with the AACR sound cautionary notes: There is more work to be done. 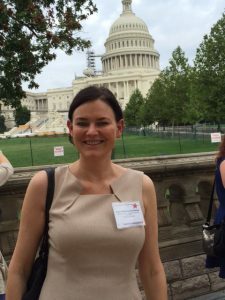 “This year was special because, for the first time since the sequester, we were able to thank our representatives for a substantial increase to the NIH,” said Anna Woloszynska-Read, PhD. 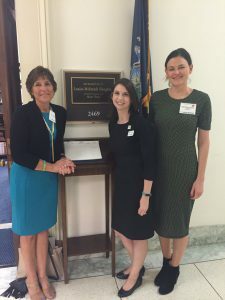 “But even though there are reasons to celebrate, we still need to push even harder and explain the very multifaceted consequences inadequate funding for the NIH has on our society.” Courtesy of Woloszynska-Read and fellow advocate Shaundra Hall, here’s a look at their day on Capitol Hill. Hall is a cervical cancer survivor whose story was featured in the 2012 AACR Cancer Progress Report. As she prepared for this year’s Rally, she booked some time with a staff member working for U.S. Rep. Trent Franks, who represents Hall’s district in Arizona. She was delighted to run into Franks himself in the foyer of his office. (Hall and Franks are pictured at left.) “I got my elevator speech in,” she says proudly, having conveyed her personal message that the progress stemming from medical research is saving lives. 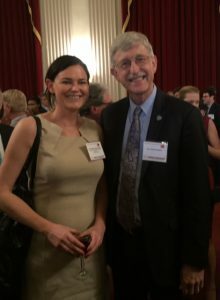 The NIH funds research into all diseases, but Hall noted her own personal interest in gynecological cancers and the human papillomavirus, which causes many of these cancers. 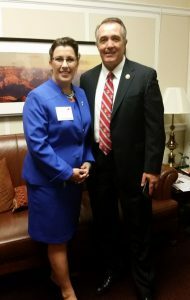 After her conversation with Franks, she met with his staffer and made plans to continue the conversation at Franks’ office in Phoenix. Hall has participated in the AACR’s Scientist↔Survivor program, which unites cancer survivors and patient advocates with scientific researchers. Hall’s participation in the program set her on a new career path, as she now works in medical research administration for a Phoenix-based health care system. “Robust and sustained funding does not solely benefit the patient through drug or device, but is an employment generator as well,” Hall says. 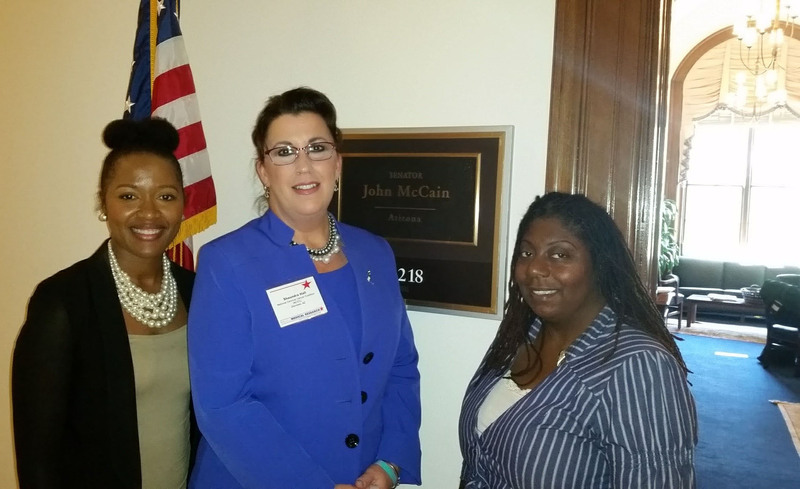 Here, she is joined outside Arizona Sen. John McCain’s office by Shimere Williams Sherwood, PhD, who was then the AACR’s associate director of health policy, and Karen Russell Mills, the AACR’s administrative manager of survivor and patient advocacy. 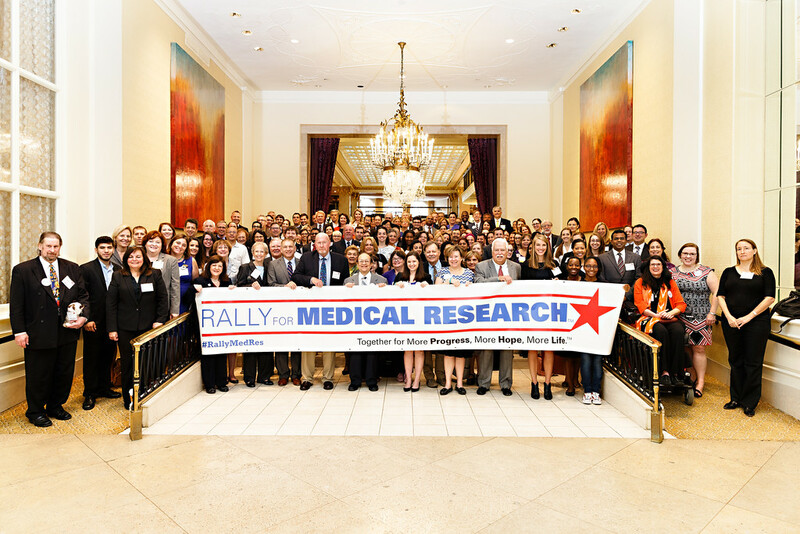 In all, the participants in this year’s Rally for Medical Research Hill Day attended more than 250 meetings, representing 37 states and the District of Columbia. They encouraged members of Congress and their staffs to continue working toward robust funding for medical research, and to pass the omnibus spending bill for fiscal year 2017 that would include a $2 billion funding increase for the NIH. This sustained stream of funding is crucial if we are to continue to improve health, spur progress, inspire hope, and save more lives. Photo by Amir West of Photo Fanatic Photography.